Great article from LDS Church News/Deseret News today about students in the Gallaudet University Institute of Religion program. At first glance, it's a religion class like any other. The teacher projects an electronic slide on the wall with an illustration of Ammon tending King Lamoni's sheep, then poses a question. Students scan the pages of the Book of Mormon, zeroing in on Alma 18. Several hands go up, and the instructor calls on someone. It soon becomes apparent that this is no ordinary classroom as the student steps in front of the class, sets the scriptures down, and begins to answer with both hands in American Sign Language. Her facial expressions help communicate her ideas. As fellow students add their comments, many hands and fingers start flying at once in a silent yet animated discussion. This class of 18- to 30-year old college students meets each Friday in the interdenominational chapel of the student center at Gallaudet University in Washington, D.C., which serves people who are deaf. The university, signed into law by Abraham Lincoln in 1864, offers its 1,500-plus students a wide range of undergraduate and graduate degrees. 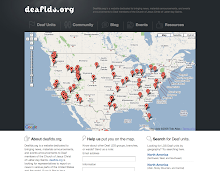 Every subject and class is taught in ASL.